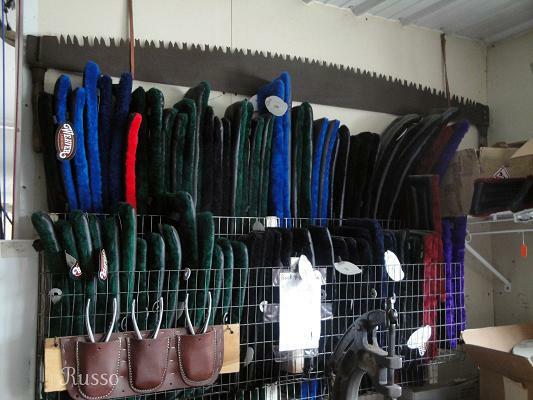 Following up Monday’s post, Beth has shared some nice photos of another harness shop. Below you’ll find photos taken at Knepp’s Collar and Harness Shop in the Daviess County, Indiana Amish community (southern Indiana). If you’re in northern Indiana, you might try Eastside Harness of Topeka. The collars on the bottom right of the second picture down are for some massive horses. Kind of surprised to see the collars hanging right side up; especially the very large collars. The weight of the collar on the cap can distort the collar out of shape. 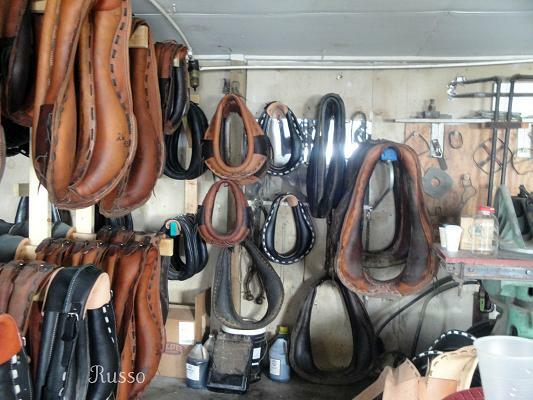 You DO NOT want to use a misshaped collar on a horse as it can lead to sore necks and galls. The general recommendation is to hang the collar upside down so the thicker throat piece takes the strain of the weight of the collar. I see the shop keeper has put carpet or some sort of padding over the top of a 2X4 to hang them on, rather than just using a nail or a hook like some people do. That is probably why he is able to get away with hanging them right side up. Oldkat this is the kind of insider knowledge I’ve come to rely upon you for! That is an interesting observation–this seems like an old shop, and seems like they would know not to do what you’ve described. I am sure that they have figured out something that works for them; afterall they are “in the business”. Just sort of caught me off guard. Looks like a nice shop though. Much better lighting than the harness shop that I was familiar with in New Wilmington, Pa. 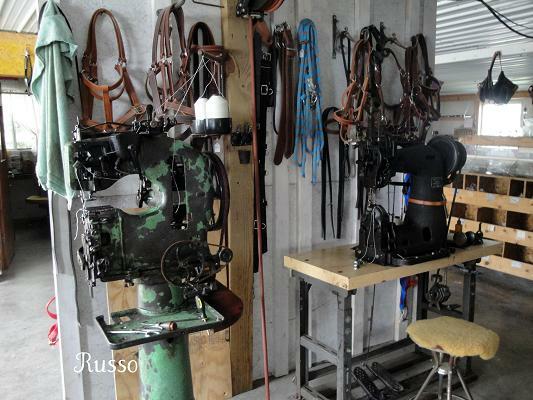 Suspect that the harness maker I knew in New Wilmington is retired by now and someone else has taken the “reins” so to speak. The shop also makes buggies for some island in Michigan where there aren’t any cars (I know it’s popular but I don’t remember the name), and my husband asked him if there was anything he would or wouldn’t put on a buggy based on religion, etc. and he said, “No, if they pay me for it, I pretty much make it how they want,” which I thought was funny. They were about to take a lunch break so they said we could walk around and take pictures of whatever. Beth these are lovely shots. I think the fellow’s answer is about how it goes for non-Amish customers. There are some buggy shops that also restore antique cars. 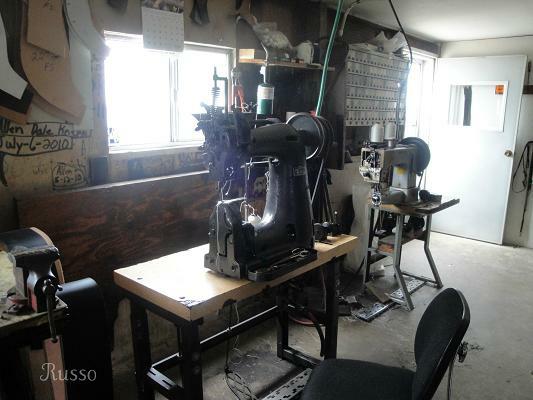 This shop is more geared toward the working field horse and maybe harness racers – trotters.It looks as if the big leather sewing machines are electric. I wondered if they were pneumatic. jim knapp — avoca mi. Beth, I believe it may be Mackinac (also called Mackinaw) Island in Michigan, where these buggies are used. I’ve been there–you have to take a ferry to get there, and no, there aren’t any cars. I didn’t know the buggies I’ve seen there were Amish-made! Cool! One thing about reading the posts from others. They mention things that I didn’t notice. Always have to go back for a second look. Thank you bunches for the pictures. Jodie I agree. We have a lot of very knowledgeable readers who are able to fill in the blanks. That adds a lot. Would they be able to make tack for a mule, since there is a difference between the two types of equines. Do Amish use mules as a normal rule, or just horses? A friend was just up there and ordered us both harness sets for our ponies. We are in Texas. This is the info she gave me. 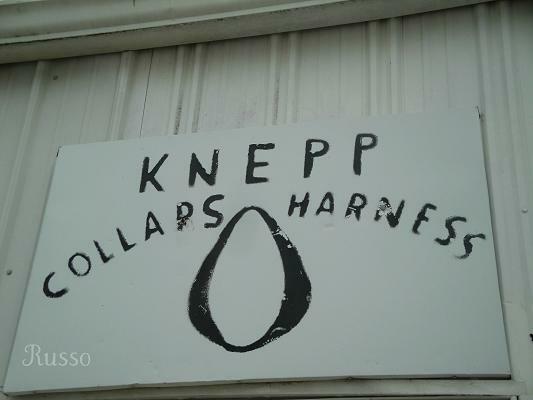 Marvin – Knepps harness shop in Lagoottee, Indiana. I did a Google search and it brought up this shop. Is this the same one?